Ricoh has unveiled a series of seven new projectors, all designed to make displays more convenient in small spaces and rooms. Two models, PJ X4241N and PJ WX4241N, are short-throw projection systems that will allow an instructor to stand in front of a screen without casting a shadow or being blinded by glare. They can use an optional electronic pen to make images on the screen or drive the device that is projecting the image, essentially turning the projection system into a whiteboard. These two projectors can display images of between 60 and 400 diagonal inches and are brighter than predecessor models with 3,300 lumens. New 360-degree installation capability makes it easier to project images onto floors and ceilings as well. The PJ WX4241N model has wireless and Wi-Fi connectivity, enabling users to operate the device from multiple networks. It is available at a suggested retail price of $1,250 while the PJ X4241N is $1,175. Two more new models, PJ X3351N and the PJ WX3351N, are designed to be placed on the end of a conference room table, freeing up working space and directing heat, glare, wires and fan sounds away from students and teachers. As with the short-throw projection systems, the PJ WX3351N model has both wireless and Wi-Fi connectivity, retailing for $1,275 while the suggested price for the PJ X3351N is $1,165. Three more new models are "Standard Install" projectors that can display images as high as 300 diagonal inches, which makes them good for engineering and science courses where engineering designs, spreadsheets and other detailed documents are used. One of the models, the PJ HD5450, is Ricoh’s first HD projector. It will retail for $1,435. The other two models, the PJ X5460 and the PJ WX5460 (which has wireless and Wi-Fi capabilities), have suggested retail prices of $1,020 and $1,186, respectively. All seven Ricoh projector models will be introduced during InfoComm 2015, scheduled June 17-19 in Orlando. 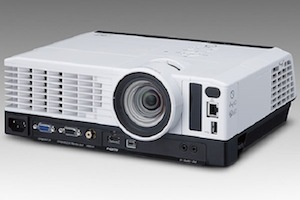 "These new projectors are brighter, easier to position and offer greater connectivity to bring participants together for more effective information-sharing sessions," said Matt Sakauchi, vice president of Ricoh's visual communications group.